SWOT Analysis is a business tool/technique used as a part of a marketing plan and overall business strategy. It is used to provide a close assessment of the company’s efficiency in dealing with its internal and external factors, ultimately aiding in improving or deteriorating the organization. Created in the mid-20th century by Albert Humphrey, a business consultant, SWOT analysis is one of the most used self-improvement methods in the business world nowadays. Not to be confused with the American law enforcement unit (SWAT). What makes SWOT Analysis a powerful marketing and risk assessing method, is that it can help you uncover a large quantity of information with a small amount of work. This method can be used on various levels of scrutiny. On a company level, it can help to analyze the entire firm’s performance. It is an efficient method to study and analyze specific departments or teams and see how their internal work affects the company’s progress. Apart from those, it can also be used on a personal level for individual improvement, and even for the wellbeing of everyday life. Select a mediator – An individual should facilitate the analysis. Pick someone whom people trust. His judgment should be as objective as possible, ruling out the possibility of aligning with a specific department of the company. Gather a diversely functional SWOT team – To start doing your SWOT analysis, it is best advised to have a group of decision-makers from different departments or teams that hold varying perspectives of the business. The objective is to have a wider and more diverse view of your SWOT factors. One way to gather opposing views is by using the Tenth Man Rule. Track ALL suggestions on a white-board or flip chart – Capture as many ideas as possible, even if they can be attributed to several business units. You should clarify from the beginning that some suggestions will appear unclear (whether it should be regarded as a strength or weakness). For example, a business unit could have several strong points in face-to-face sales, but may also have some weaknesses in the same area. During this phase, you should not worry about evaluating them. Ultimately, remove or omit all duplicates. Visualize all suggestions and consolidate them – If you are using a whiteboard, you probably have all suggestions visible on the board already. In case you are using a flip-chart, append all pages on the wall. Even when being extremely careful about not including duplicates, some ideas still end up overlapping. Discuss with the group which suggestions can be consolidated under a single statement or heading. If you overdo it, however, the over-coupling of ideas can turn out to be more detrimental, ultimately decreasing focus. Go through the list and clarify unclear statements – This one is self-explanatory. If anyone has an unclear understanding of a statement, discuss it together so you can all be on the same page. Sometimes it happens that members from one department or business unit understand a competency/statement differently from members of other departments. Or they might have simply not been paying attention when that point was discussed. Pinpoint top 5 strengths – You should try to reach consensus on at least 3 top strengths. Sometimes, they can be quite obvious and there will not be a need for voting and discussion. In most situations, however, that won’t be the case. Assign 3-5 votes to each member. If the list of suggestions is greater than 10-12, it’s a good idea to assign at least 5 votes. Allow at least 10 minutes for each member to make his decision. If the results are inconclusive, discuss the top results and vote again until you achieve a consensus. Summarize the strengths – List the top picked strengths on a single page or flip-chart. Repeat all steps from step 2 to step 8 for the WEAKNESSES – The same steps apply for analyzing the company’s or business unit’s weaknesses. When conducting the same analysis for the pinpointing Opportunities and Threats, you need to extend the team members. Since the following two consider mainly external factors, you will have to include team members from suppliers and contractors. Pretty much people that your company or unit has to work with on a daily basis. For example, if you are conducting a SWOT Analysis for your digital marketing strategy plan, you will want to include one or more of your SEO consultants. Additionally, you could also include some of your most trustworthy and senior content creators and copywriters. Lastly, compile all the gathered points into a final report, easily shareable with all stakeholders that could/will be influenced by it. Determine your objective clearly: Make sure that after putting together your SWOT analysis team, all the team members know your goals, the company’s structure, and the end goal of conducting the analysis. Self-Criticize: SWOT analysis is a self-reflection mechanism, therefore, the most important factor to hold is that you want to conduct a critical examination of your organization. So, be honest, accepting, and build upon this criticism. Be comprehensive: Make sure to include all major and minor details, but all details nevertheless. 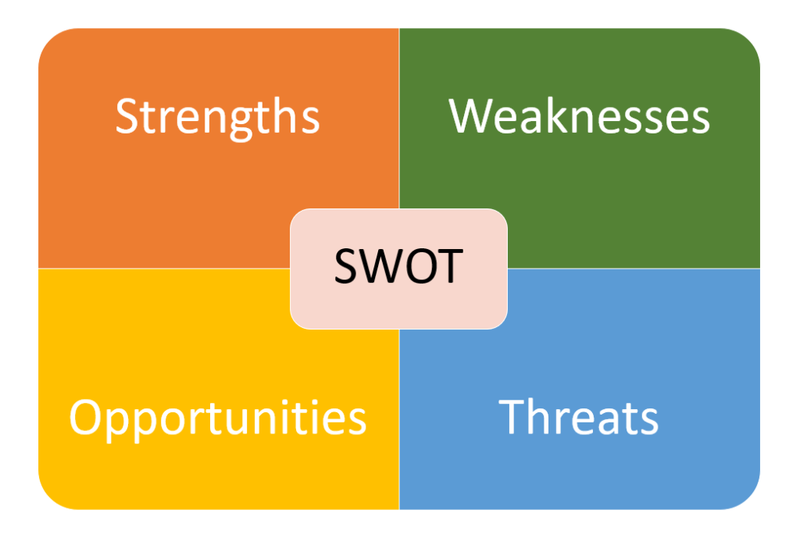 SWOT analysis’ purpose is to look into your deepest strengths and weaknesses to find out a solution management for them, and sometimes, the slightest details might be your organization’s most significant SWOT factors. List your factors right: After you list all your SWOT, apply them to a four-squared template, like the one in the image above. This creates a visual aid for the team to comprehend the information. As a result, onboarding additional members on analyzed factors becomes much easier. Revise your steps: Once the previous steps are finalized, run through the process again to make sure you have not forgotten to add any factors, and that each factor is at its right place. After you complete the steps above and you have your SWOT analysis set clearly in front of you, the next step to take is finding the proper ways to deal with these factors by focusing on reinforcing your Strengths, minimizing Weaknesses, capturing Opportunities, and avoiding/facing Threats. Now that we understand what SWOT Analysis is, let us dig deeper into its elements, to comprehend the four components better. These are a limited sample of strengths your organization might have. Any internal element within your control that adds value or offers a competitive advantage to your organization is eligible for this list. Finding your weaknesses will help you tackle your internal issues, so performance optimization can be achieved once the issues are identified and eliminated. This leads to a higher organizational efficiency, as it ensures more time to focus on improving your overall progress rather than solving internal problems. Knowing these opportunities helps your organization to prosper in the market, all the while achieving higher profits. It also provides a small glimpse of the future, thus aiding in strategy planning. Recognizing these threats can help your organization enhance its performance in certain areas, or eliminate future problems, and can be turned into benefits if you are able to adapt to these threats with careful planning and risk management. Positioning between competitors – By conducting SWOT analysis on your competitors, and comparing the factors with those of your organization, you can find out the best way to position your organization in the market, using your strengths against your competitors’ weaknesses. Discovering Opportunities – Seizing opportunities is essential for your business’ growth and one of the best ways to discover these opportunities is through conducting a SWOT analysis. For example, you can discover new customer segments to target, a new trend that you can use for marketing purposes, or even a whole new market to enter. Assessing Risks – All businesses face risks on daily basis, each differing in the damage it can cause, which can have more impact than the threats from competitors. Therefore, you should assess risks so the company can have a strategy prepared in case threats materialize. An example of such a threat is an economic recession where customers tend to spend less money on luxurious products. In today’s business world, there exist many business process analysis methods for marketing or project planning, so when should you choose SWOT analysis over other practices? The PEST method (interlink article if existent) or PESTLE (prolonged PEST) are two other well-known marketing and risk assessing methods. The first takes into account environmental factors, and just like SWOT, you can find them in its name: Political, Economic, Social, and Technological. PESTLE takes Legal and Environmental factors into account as well. What distinguishes SWOT analysis is that unlike PESTLE, SWOT takes internal factors into account, along with external ones. PESTLE, however, takes only external aspects into consideration. So why not use SWOT all the time over PESTLE you might ask? Well, that is because PESTLE gives an in-depth look at its components, categorizes them, shows how they affect your organization, and details them. Whilst SWOT analysis looks at every internal/external factor considering them all equally, rather than focusing on specific points, giving a less detailed account of its factors. However, this does not mean that we cannot use both methods together. In many cases, we might see organizations taking PESTLE factors and combining them with a SWOT analysis, as it helps them uncover incoming opportunities and threats, and understanding them better. Similar to the PESTLE, Porter’s 5 takes into considerations the external factors and disregards the internal ones. Moreover, SWOT analysis looks at your organization from a macro perspective, whilst Porter’s 5 looks at the organization from a micro perspective, taking specific elements and analyzing them in detail. Therefore, when you use SWOT analysis, you get a bigger picture of the whole internal and external structure of your organization. When using Porter’s 5, you get detailed information about external segments of the industry as a whole. However, even though SWOT analysis is one of the best mechanisms available nowadays, it does have its cons and limits. One such limit is that SWOT analysis focuses on the present issues. Therefore, it doesn’t always take historical and future perspectives. In fact, it only shows the current elements of your organization’s SWOT. Moreover, SWOT analysis doesn’t always capture all factors of the elements, as there is no fundamental formula to follow, and is highly dependent on human skills. TOWS is an acronym of SWOT with a different arrangement of the elements of Strength, Weakness, Opportunities, and Threats. The main difference between SWOT analysis and TOWS matrix is that TOWS prioritizes external factors over internal factors. You can regard TOWS as a more dynamic approach to SWOT analysis. Several firms or business units conduct their respective SWOT analysis and stop there. What’s the point of conducting it in the first place, if you are not going to develop a pro-active approach for each issue? That’s where TOWS steps in. Combining the two approaches will maximize improvements in the company’s overall business processes. Whilst SWOT analysis points out the four factors, TOWS matrix helps you build a strategy. Thus allowing you to focus on the options you can pursue. To do so, one has to link their organization’s strengths and weaknesses with the threats and opportunities. Then, you can find out how to use the internal factors to find the best available options for the external ones. SWOT analysis is one of the starting business tools in business process and project development. It offers a full view of the organization’s performance using its internal and external elements. However, SWOT analysis is not the only method available, but its cheap cost, flexibility, quick assessment, and macro perspective, make it one of the most popular tools among businesses. Moreover, it is important to make sure that the information used in the SWOT analysis is accurate and the data are valid and not biased. Having false or biased information will make the whole process worthless and give unrealistic results. Conclusively, one should make sure that SWOT analysis is not the last and only step in analyzing your business or building a new strategy, as it only points out the factors of your organization. You should use SWOT as a stepping stone for further methods to build on. The ultimate goal is to enhance and optimize your organization or department. What did you think while reading this post? Were you able to find all the information you needed in order to get you started with your organization’s SWOT Analysis? Or are you planning on using it for analyzing your personal life strategy? If you think we missed something, or you would like to share your personal experience with similar tools, let us know in the comments section below. 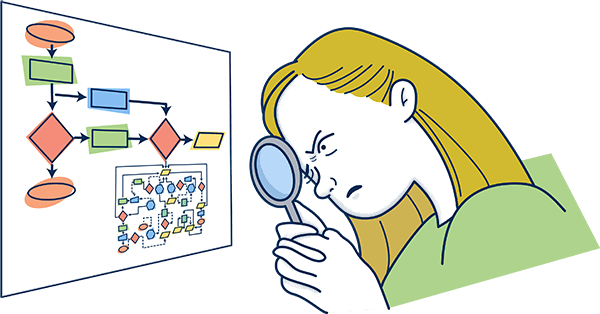 Definition – What is Workflow Analysis? ← Question – Is business process management dying or merely changing?